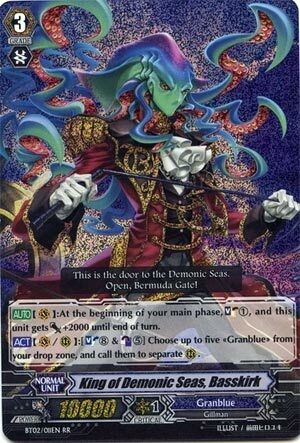 [AUTO](VC):At the beginning of your main phase, Soul Charge (1), and this unit gets [Power]+2000 until end of turn. [ACT](VC/RC):[Soul Blast (8) & Counter Blast (5)] Choose up to five «Granblue» from your drop zone, and call them to separate (RC). Oh I remember this guy. Good old Basskirk soul abuse…for those of you using Basskirk right, anyway, because the Megablast was a bit much for my liking. Actually worked decently well as its own deck, but we live in modern times now.